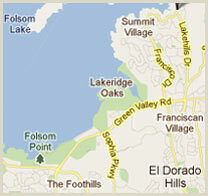 From U.S. 50, exit at El Dorado Hills Blvd and continue 3.5 miles north to Francisco Blvd (arterial stop sign). Turn left on Francisco and continue 1.2 miles north, past Marina Village Middle School, to the entrance to The Summit (Promontory Dr. on left). From Folsom, take Blue Ravine, Natoma St or Sophia Parkway to Green Valley Road. Head northeast on Green Valley Road to Francisco Blvd. Turn left (north) onto Francisco and continue 1.2 miles north, past Marina Village Middle School, to the entrance to The Summit (Promontory Dr. on left).